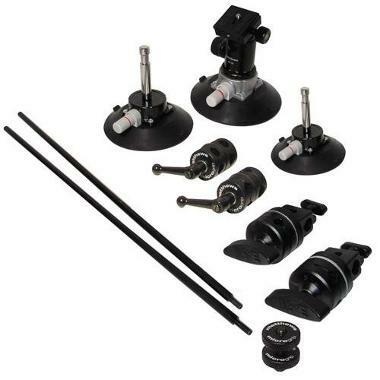 The Matthews Pro Car Mount System provides you with a strong, versatile, and reliable system for mounting cameras to cars, trucks, boats, trains, and even low-flying airplanes. It is recommended that you always use auxiliary straps (not included) with this kit for safety. • Please take care to test your surface with these suctions for strength before committing your gear to it. • Not suitable for super porous surfaces.